Right from the time, you know that “he is the one!” You’ve already boarded the roller-coaster ride. Though every function is close to the bride’s heart but pre wedding shoots are the closest. They give a picture to your chemistry that can be seen by not only you but the whole world. Pre wedding photo shoots have seen a drastic change over time; It is no more about dancing around the trees, being surrounded by heart-shaped balloons or dressing up like your favourite actors. Well if you have missed all the drama of pre-wedding shoots, don’t you worry as we bring you some creative pre wedding shoot ideas for the same. 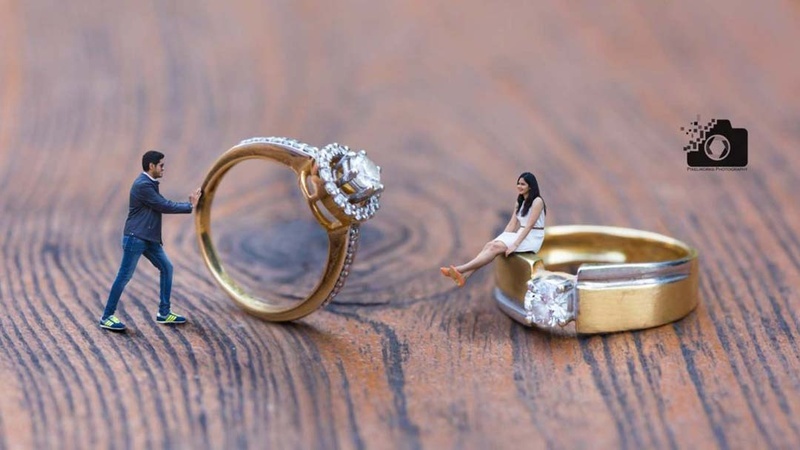 Let’s go Downsizing….We bet you mustn’t have come across such a brilliant pre-wedding shoot idea. Ya, I guess this one is inspired from the Hollywood movie, Downsizing. Well!! Hollywood does give us some trendy and fresh ideas to incorporate! At your Fav designer’s store – Looking for something elegant & grand? Check this out, this couple chose to have a creative pre wedding shoot at Sabyasachi’s flagship store in Mumbai & the results are just ah-mazing! Best part, you also get to wear your favourite outfit from the designer’s showroom for the shoot, yay! Check out more pics from this pre wedding shoot here! For the foodie couple - Main Starbucks, tu cutting chai, phir bhi gazab hai yeh prem kahani! No fishy business, just love here! Love this pre-wedding shoot idea, such an awesome way to declare your wedding date! Did you say fur babies? I know we love them more than anything in this world. So, why not include them as well in your pre wedding photoshoots. This creative pre wedding shoot idea will surely shoot up the cute-o-meter! Check out more such amazing pictures of pre wedding photoshoot with pets here! Fond of cooking? These pre wedding photoshoot ideas are perfect for the foodie couple. The brilliant theme will surely give you some major cooking goals! Show your love for the city, capture the places where you had those first coffee sessions, your first car ride together or your first sight of the sunset together – and voila you have a great pre-wedding shoot! Check out this wedding held at the serene atmosphere of South Bombay here! Badal pe paaon hai!! Ya, not literally but you surely can with this very fresh pre wedding photoshoot idea. Underwater Scenes!! For the water babies, these pre-wedding pictures clicked by Wedding Nama are a sheer inspiration! Check more underwater pre wedding stories here! Drone Photography is one of the latest trending one in pre-wedding photoshoots, well what better way to use technology than for love! Biker boys and gals, That’s the way you rock it. Check out this pre wedding photoshoot ideas, Don’t they look trendy? Flaunt your engagement rings- Post engagement you can’t help but stare at your rings…Why not make the world stare at them too! This one is definitely a pretty cool & easy-to-do idea for your pre wedding shoot. Go Bold! For those who don’t shy out to express their love out in the open. These pre wedding shoot poses are a must try! The tip for this pre wedding shoot idea is that just be yourself and let your chemistry do the work! The Vintage Look! Don’t you just love classic? Well we totally do. We adore this idea of going retro for a fun pre-wedding photoshoot. All you need to do is rent out a few of the retro attires & props and choose any apt outdoor location for the pre wedding shoot. Check out more from this pre wedding shoot here! Frame it up! Like literally? Ya, so we usually click pictures and then frame. Just turn the sequence add frame and then click 😉 what say? Amidst Nature: Show your love for nature. The bright stars, the setting sun, the blowing wind and naughty waves are made for beautiful captures, why not include your love in the same frame. With Holi around the corner, you can opt for these vibrant pre wedding shoot poses and add vibrancy to your pre wedding album. Take a break from colours and go black and white! Check out these beautiful pictures shot in B n W still so vibrant! If you like it grand and can go that extra mile for your pre wedding shoot, get inspired from this pre wedding album shot in Paris! With this, our list of unique pre wedding shoot ideas comes to an end. We’re guessing that by now you would have shortlisted a few ideas for your pre wedding shoot already!